Mt Kilauea is a volcano on Hawaii s Big Islandand is one of worlds most easily accessible volcanoes and is often called the "drive by volcano" as many of the main sites are accessible by car within the Hawaii volcanoes National Park. There is a lot to see here so a couple of days is advised especially if you want to all the walks. 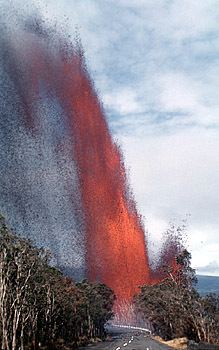 Read on for more Mount Kilauea facts and Kilauea eruption information. The Kilauea Summit area is currently experiencing the first eruptive activity since 1924. Visitors should check the with the visitor centre before proceeding to check access to summit area.Lava viewing is possible near the southern coast where it flows spectacularly into the sea. Located in the south of the Big Island within the Hawaii Volcanoes National Park. Kilauea sits on the shoulder of Mauna Loa and the summit is only 1247m (4091ft). There are no steep cinder cone slopes here as this is a shield volcano and slopes are very low angled and gentle due to successive lava flows. Kilauea has been active for 23,000 years and has been continuously erupting since 1983 ; 90% of the volcano is less than 1,100 years old. 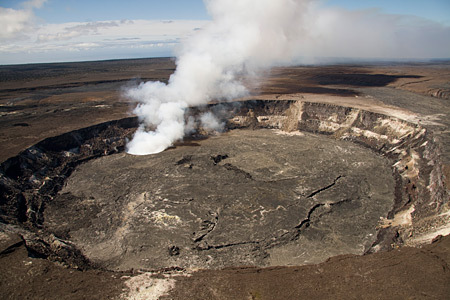 The summit caldera is around 11 miles in circumference and contains the Halema'uma'u crater (active 1974), the home of Pele, and the Kilauea Iki (little Kilauea) crater which was active in 1959. The floor of the caldera contains lava flows from the 1970s and 1980s, the most recent being lava from 1982. 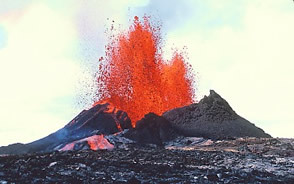 The Pu'u' oo ( "Poo-oo Oh Oh") vent on the southern slope of the volcano ,along the south eastern rift zone,is the site of current activity and first became active in 1983 with lava fountains 460m high. Lava travels 11-12km downslope until it reaches the sea where it has added 2km 2 to Big Island. 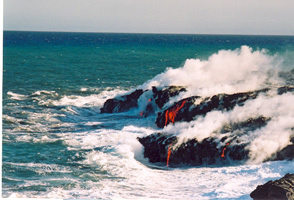 In 1990 the eruption shifted to another vent called Kupa'ianaha ,this eruption engulfed the main coast road , the town of Kalpana and the Waha'ulu visitor centre in. The Kilauea Summit area is currently experiencing the first eruptive activity since 1924. The southern section of Crater Rim Drive is could be closed . Visitors should check the with the visitor centre before proceeding to access the summit area. Volcanoes National Park includes the summit area of Mauna loa and covers more than 1 million acres from the shore to Mauna Loas crater. There are over 150 miles of walks but most of the main volcanic sites can be seen by a variety of short excursions on foot from a car park. Wilder back country trails require pre-planning and precaution but the park has things to see for all ages and abilitites. At the park entrance you buy a three day pass and you will get a map. First stop is the Kilaeua Visitor centre near the craters rim. Here you can pick up advice from the rangers on viewing the lava as it flows into the sea at he end of the chain of craters road. There is a shop with a great variety of volcano reading material and a film on the eruptions of Kilauea. Nearby is the Volcano arts centre selling local art and crafts. The 11mile crater rim drive is the most popular way to see the volcano and the order here is for an anticlockwise circuit – but you can go the other way too! You can walk all the round as well on the Crater rim trail. 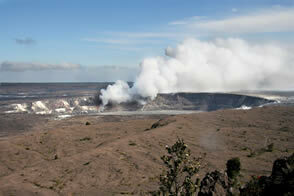 steam seeps from the crater rim and swirls around. A short walk from the car park brings you to a panoramic view of Kilaueas crater. It seems vast and like a moonscape with towering cliffs. The near circular depression to the right is the Halema’uma crater which is mythical home of Pele and was last active in 1974. The Jagger museum was named after Professor Jagger who set up the Hawaiian Volcanic Observatory. It has some interesting displays about the volcano and worth a stop. You really feel like you are on fresh ground here as you follow a rift where lava has poured out. It is tempting to keep walking and walking but remember you have to walk back! The Kilauea Summit area is currently experiencing the first eruptive activity since 1924. The southern section of Crater Rim Drive is currently closed until further notice. This is a popular spot and up to the craters rim you probably won’t find much solitude but walk a little further will probably have the volcano to yourself . A short walk from the car park will bring you to the craters rim, this is the home of Pele and you probably see offerings which have been made to the Volcano Goddess here. The crater floor below was last active in 1974 but has been a boiling cauldron of lava in the past and probably will be again. If you carry on along the trail you can follow the 3.2 mile Halema’uma Trail across Kilaeuas crater floor back to the Visitor centre. Although only a few miles the trail is exposed and only marked with cairns which are tricky to follow across the jumble of lava flows and vents. The Hawaiian sun and black lava make it a worthwhile but hot and intense walk so take plenty of water and keep your eyes peeled for the next cairn. Before reaching the visitor centre you will have to climb up out of the crater up a steep path. 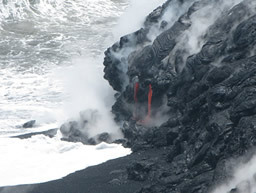 The lava crust can give way under foot and although you won’t fall into a pit of boiling lava it can be disconcerting. The road continues through lava flows from 1982 to the Devastation Trail head. It is a 1km walk to the craters edge through a landscape devastated by the 1959 eruption of Kilauea Iki .Cinders and ash from the eruption covered the natural rainforest vegetation here. This a short walk through a lava tube of 0.3 miles. The top of a lava flow has roofed over as it cooled then the liquid hot lava ranout leaving a long black tunnel. It is lit so not pitch dark. This offshoot crater from Kilaeua spectacularly erupted in 1959 as boiling mass of lava lake and lava fountain. Lava bath rings can be seen where the level of the lava varied in the pond. Now the crater flow is solid a 3.5 miles round trip hike can be taken across the solidified lava from the crater rim and takes about 2 hours. The road is not affected by current activity. The 40 mile round trip down to the coast along the chain of craters road is your best opportunity to see molten lava. The road descends 3700 ft to the coast along the Eastern Rift zone(webcam). You will cross numerous lava fields and get some scale of the output of Kilauea. There is plenty to see on the way down. Lua Manu ( Bird crater),Puhimau (Ever smoking),Hi'iaka last erupted in 1973 covering the road with lava,Pauahi (Destroyed by Fire) at 520m long and 100m deep last erupted in 1973 and Mauna Ulu last active in 1973. From the Mauna Ulu car park the 10 mile Napau Trail starts , the first mile is worth doing if you are short on time. Further on down the road descends steeply over a stepped scarp which has lava from Mauna Ulu draped down its face.You may be able to see the steam and smoke from the ongoing eruption as you descend to the coast. The white dots are probably people! Once near the coast it becomes obvious where to park- on the roadside with all the other cars! Here you leave the car behind and start your hike out over some of the newest land on earth. There is a national park cabin offerning advice and warning on walking to the lava flows. The trail to the lava is partly marked over pahoe hoe but is by no means a definite path and you may find yourself weaving around a bit. The ground is still hot in places but for the most part is over smooth new pahoehoe from the Pu'u' oo eruption. The crust can give way so watch where you put your feet. If you are planning to stay past dusk then it is absolutely vital to take a torch with you. The sun sets roughly at 7pm in Hawaii but here it sets behind Kilaeua and it gets dark even quicker. The ropes are their to keep you safe as the coast line can suddenly collapse (bench collapse) or the lava explode on contact with the sea.The path has only one beacon on to guide lava hunters back to their car. What you will see at the end of the trail is dependent on current activity you might see rivers of lava cascading beautifully into the sea or you might not! So it is worth checking on activity with the Park rangers or the link below. Take a camera and plenty of water its hot work this lava watching in the tropical sun and you might be so mesmerised you stay out longer than you thought.